Structure My Deal tools are complete — you're ready to visit Grieco Toyota! $2,999 includes $2,170 down, 1st payment, $0 security deposit, $650 acq fee, and assumes $2,075 TFS bonus cash. Plus tax, reg and $220 doc fee. With approved credit. $3,792 includes $2,999 cash or trade, 1st payment, $0 security deposit, $595 acq fee.Plus tax, reg. and $459 doc fee. With approved credit. 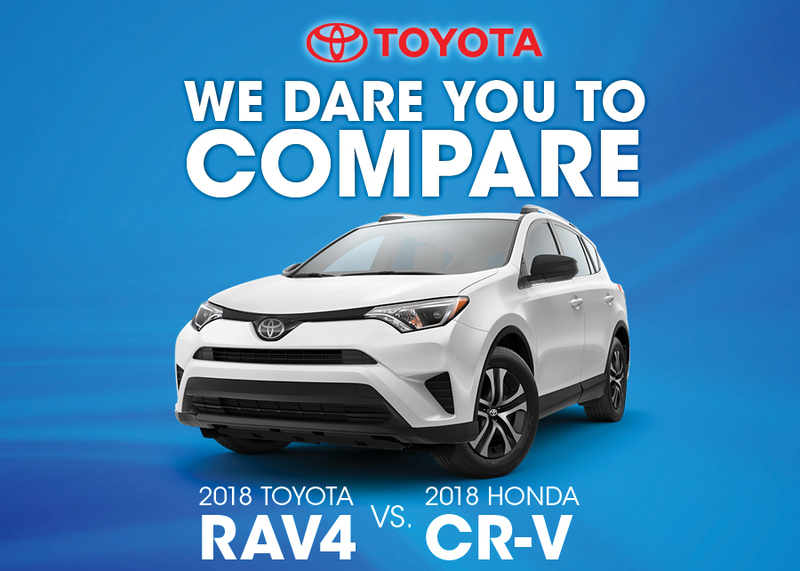 Reasons why the Toyota RAV4 beats the Honda CR-V. The 2018 Toyota RAV4 LE AWD brings you sporty style and performance along with a versatile interior and modern technological features. But with popular choices like the 2018 Honda CRV LX AWD, how do you know if the RAV4 is really the better option? Well here's a list of features that make RAV4 the clear winner. RAV4 offers a 6-speed automatic transmission and has a more energetic response and responsive ride compared to CR-V with its variable transmission. Taller drivers and passengers will appreciate the extra comfort with 42.6 inches of front legroom, while the CR-V only offers 41.3 inches of front legroom. RAV4 features a 15.9-gallon fuel tank and a 400-mile cruising range compared to CR-V's smaller 14-gallon tank. Features like standard voice-activated controls, privacy glass, seat back storage and an optional body side step make your ride more convenient in the RAV4, while the CR-V does not offer these extra features. Standard front knee airbags and optional fog lights are additional safety features you'll find in the RAV4 but not in the CR-V.
For more information about the 2018 Rav4, visit us today at Grieco Toyota in East Providence and be sure to check out our online inventory for photos, prices and more, of our current Toyotas in stock.